AgroAtlas - Relatives - Cerasus maximowiczii (Rupr.) Kom. - Maximovich's cherry. Family Rosaceae Juss. genus Cerasus Hill. A tree, up to 7 m high, or less frequently a shrub, with dark-gray rough bark and outspread branches. Young offshoots demonstrate dense appressed pilosity. Buds are ovoid with brown scales; the lower ones are tawny pilose. Leaves are 3.5-9 cm long and 2-5 cm wide, rhombic-elliptic, less frequently obovate, at the top abruptly narrowed into a long cusp, with deep double or treble dentation along the edges; the upper surface is either covered with dispersed hairs or almost naked, the underside is pilose only along the veins. Petioles are 4-8 times shorter than the laminae, densely covered with appressed yellowish hairs, without glandules. Flowers are assembled by (3) 5-9 in corymbose racemes. Bracts are foliaceous, 5-13 (15) mm long, ovate or rounded, dentate. The rachis, pedicels, cup-shaped hypanthium and sepals are covered with dense pubescence of yellowish upright hairs. Flowers are white, 10-16 mm in diameter. Fruits are ovoid-roundish, small, 6-9 mm in length, brightly red in the beginning, turning black at maturity, with strongly staining violet-black juice and bitter flavor. Kernels are round, with weakly expressed sparse reticulation of ribs over the whole surface. Entomophilous. Autochore. Propagated by seeds, softwood and root cuttings. Seeds require stratification for 3-4 months at 3-5 degrees Centigrade. Blossoms in May; bears fruit in August. 2n=16. Russian Far East (Amur basin, Maritime region, Kurile Islands - Shikotan, Kunashir, Iturup: Sakhalin - southern and central areas), China, Korea and Japan. Mesophyte. Drought-resistant. Grows singly or in small groups in shadowy mixed spruce-broadleaved or cedar-broadleaved forests; sometimes comes out to mountainsides with shrubby and grassy vegetation up to 800 m above sea level. Ornamental, melliferous. This species is very cold-resistant and may serve as seedling stock for cultivated cherry in the Far East's horticulture. Brezhnev, D.D., Korovina, O.N. 1981. 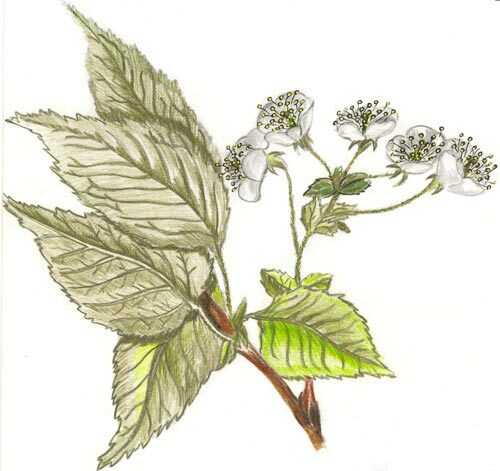 Wild relatives of cultivated plants in the flora of the USSR. Leningrad: Kolos, pp.180-181. (in Russian). Koropachinskiy, I.Yu., Vstovskaya, T.N. 2002. Woody plants of the Asian part of Russia. Novosibirsk: Publishing House of SB RAS, Branch "Geo", pp.338-339. (in Russian). Poyarkova, A.I. 1941. Cherry - Cerasus Hill. (Flora of the USSR.) Moscow/Leningrad: Publishing House of the USSR Academy of Sciences, vol. 10, pp.550-551. (in Russian). Copyright for picture belongs Egor Chukhin.